The most productive people on Earth aren’t superheroes. They have the same amount of hours in their day as you do, and often find ways to work far fewer hours, too. How do they do it? When I was struggling to stay on top of my new responsibilities, I was asking the same question. Over time, I discovered task management techniques, to-do list apps and how to stay off Twitter to focus on work that matters. I’m writing this task management guide because I want to share with you what I’ve learned since being thrown from office grunt work to the hectic life of a startup employee. 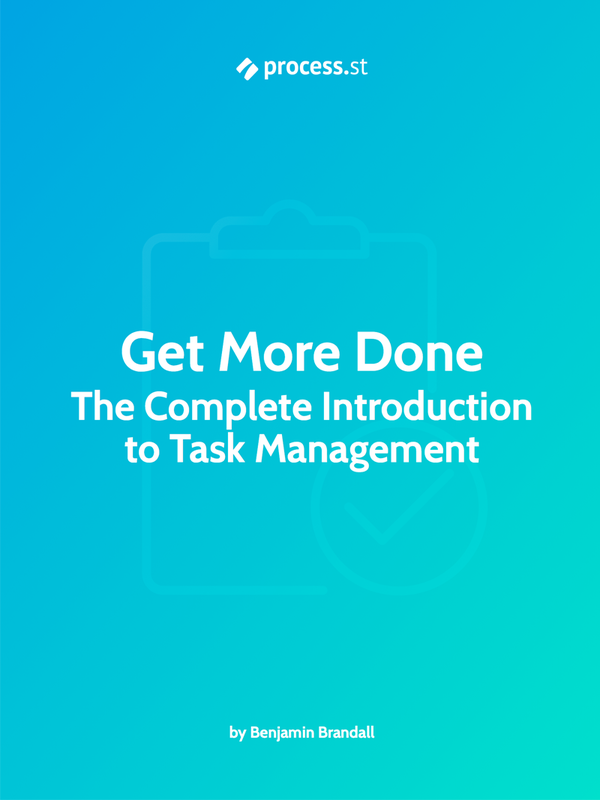 Over the next few chapters, I’ll be writing a huge guide to task management that will help you write your to-do list, stay on top of your workload and get more done. There are several major ways to manage tasks, some of which were created to help software developers, and some for general purposes. Even the ones for developers can be applied to everyday life, and they are some of the most efficient because they’ve been developed by people who desperately need to stay organized and work quickly. 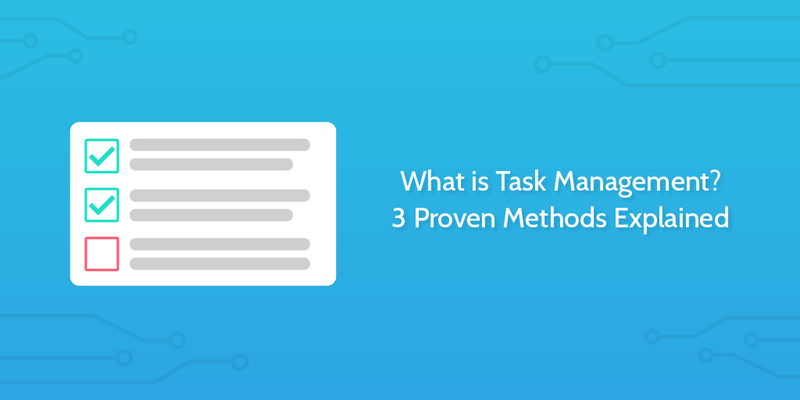 Here are three task management methods which make up the core of my workflow, and the workflows of millions of other people. Developed in the 1940s by Toyota, Kanban (Japanese for sign or card) is a task management system you’ll definitely recognize if you’ve ever used apps like Trello or Kanbanchi. For the purpose of an example, you start off with a whiteboard and divide it into several columns, such as ‘backlog’, ‘in progress’, ‘waiting approval’ and ‘done’. Put all of your tasks on post-it notes in the left-hand column. As you start them or make progress on your tasks, move the corresponding post-it notes from column to column. While Trello is great if you’re collaborating with others (see a full rundown here), for solo task management a whiteboard can be just as effective because it’s a physical object and you don’t have to go on a website to see it. A core principle of Kanban is to limit the amount of tasks currently in progress. Think about it this way: a physical whiteboard has a limited amount of space on it. If you want to add another task to ‘in progress’, you’re going to have to move one through the flow to make room for it. While there’s no enforceable number of tasks you can have in progress at any one time, for Kanban to work properly, you should set yourself limits based on what you think your output capacity is. To find out more about Kanban, I’d recommend checking out LeanKit’s ebook on the topic, Kanban Roadmap or this simple getting started guide from Kanban Blog. In 2001, a small group of software developers got together and came up with a whole new way of managing their projects. For the most part, before 2001, project management consisted of slow, bloated processes with far too many people and documentation involved. Changes were difficult to make, teams size was ridiculous and moving forward with a project was akin to the bureaucracy you’d expect to get in your way if you wanted to make an appeal to the government. Agile sought to change all that. With smaller team sizes, short sprints of work, quick iterations and testing rather than debating, it helped teams get more done with their time even if it was potentially ‘riskier’ than having work checked and re-checked by every middle manager under the sun. As you’ll see if you look at the original principles of agile, it’s not a concrete task management system like Kanban. It is, however, a set of guidelines you can work off to refine your own system. At Process Street, we use a combination of Agile and Kanban, meaning we keep a Trello board of all tasks and instead of waiting week for approval we take the initiative to make improvements and iterations of our own accord, delivering small chunks of work often instead of hiding away for weeks working on a project that could need scrapping and starting all over. If you like the sound of Agile and want to implement it for yourself, this guide will contain elements of it throughout. For a pre-made system, I’d recommend taking a look at Agile Results by Asian Efficiency. Around the same time as Agile came to be, David Allen wrote his extremely popular book — Getting Things Done (GTD). In the book, he outlined a task management system with the philosophy that “the head is for having ideas, not holding them”. And that’s true. The maximum number of items you can hold in working memory is around 7, so if you don’t write down your tasks regularly you’re going to end up forgetting most of them. The idea is to transform ideas and whims into physical actions. Based on a freeform list, you extract tasks, break them into sub-tasks, prioritize them and set yourself a deadline for each. Once you’ve emptied your brain onto paper, you look at everything you’ve got there. You might have things like “Learn to cook”, “Take Kitty to the vets next Thursday at 2pm”, or “Start collecting Windows 98 user manuals”. Looking at your list, mark everything that isn’t immediately actionable and start asking yourself how you could break it down even more. If you’re learning to cook, you can’t just take one action and suddenly know how to, so you break it down. Ask yourself ‘what’s the first step here?’. It might be that you need to research cooking classes in your local area, or buy a recipe book. For the rest of your tasks, if they are actionable and can be done in under two minutes, just do it right away. If they will take longer, now’s the time to prioritize and schedule. Working inside this methodology, you’ll gradually knock out even the largest, most imposing projects and start achieving your goals. For a 15-minute overview, check out this fantastic guide. There’ll also be more on GTD in the next chapters. How can you use these methods? Funnily enough, these methods aren’t exclusive. You don’t block yourself off from using Agile if you’re also using GTD. In fact, I use a mixture of all three. Here’s how I do it. I like to think of these methods as layers, with GTD as the foundation (without that I’d not have a good list of what I need to do), Agile as the mindset for getting through my tasks quickly, and Kanban as the layer that sits on top of it all, helping me get an at-a-glance overview of my upcoming, in progress and done tasks. This guide will teach you how to manage your tasks, prioritize properly, and get a ton of important work done. …But what good are those hours if you’re not managing tasks properly? I’ve improved my productivity threefold since I started researching and writing this ebook, and it’ll help you too change bad habits and put you on the path to productivity. Thanks for short enough but very informative/concentrated article. Happy to help, Arnoldas! I was hoping it’d be a quick intro without the fluff. Thoroughly enjoyed this post, Benjamin. I’m least familiar with Agile methodology. Do you reckon it applies equally to service based businesses such as ours or is it mostly relevant for software companies? By the way, I use Trello and set every single client I work with and their respective teams up with Trello. We learned this framework on the WPCurve blog and it works really well. We then schedule the first task of every single day for each team member to be “go through your to-do list and move the 2 most important items to the very top”. That’s an interesting workflow setup. I’d say that Agile is more of a mindset than a strict framework. It’s the idea that you work in sprints and regularly evaluate output, working quickly instead of thoroughly and, instead of tons of work in one go, short bursts with lots of iteration. Have you found that it’s hard to track every team member’s individual boards? How do you set up the review process accross multiple boards? I set up on board per company that I consult with (including my own business). So let’s say I set up a board called Process Street. And let’s further suppose that you and I are the sole team members. We’d have 6 lists in the board. In terms of tracking actual productivity, most of the founders I work with don’t really nag their team members about individual tasks; they focus more on monthly/quarterly/yearly KPIs. However the team members meet their KPIs is their business. The exception to this would be if you have an important task that depends on me first completing a task before you can move forward. In that case you’d message me in Slack, let me know how critical the item is, and then I’d re-arrange my Trello list to put that item nearer the top. That’s awesome. I love your workflow, and it seems like it’d make an interesting blog article. We do a similar thing at Process Street: we store formal information inside Trello cards, then when it’s time for review we paste URLs to the important cards in Slack, and let the rest be reviewed on a regular schedule in a ‘for review’ list on their relevant boards. Thanks for your clear explanations. I also use a combination of these methods. Trello works well on desktop and mobile. I haven’t found a suitable tool for GTD. Any.do is simplistic and better on mobile. Asana is capable but feels cluttered. The search continues …. ‘better on mobile’ is a really nice way to put it. Anywhere else, it’s horrific. I’ve abandoned everything apart from a paper notebook and TaskPaper which is great if you’re a fan of WorkFlowy. I can’t say I’m a fan of Asana for personal productivity at all. Trello is head and shoulders above. But regardless, I like how TaskPaper can be squashed down into the side of my screen and act as a sidebar for my day-to-day tasks, which I tag with @today the night before and never come out of that view until it’s time for the next day’s tasks that evening. Hey Benjamin thanks for the great article. I have a test version of process street and am looking at using it for my company. I had somewhat equated process street to a variation of some of these task and project type programs like asana basecamp todoist etc. I found this article because I was trying to see if process street had a kanban view for its processes which i like for the reasons you said. I did read your pdf ebook and noticed that no where in your work flow did it include process street which your company designed and I would have thought you as a content creator would be selling. Could you tell me where I am off on this? Thanks so much for reading! While Process Street can be used to manage tasks, it’s not a task manager as such. It’s a process manager, which means you can document your processes, and then run them as checklists each time you execute the process. With your processes loaded in, you can then even automate parts of them. Check out our help site (it has a great getting started guide! ), or send me an email at [email protected] if you’d like some more help. K… would love to see a way to see those processes viewable in a kanban view as for a long time I have been studying the benefits of that visualization to seeing flow in a process. Is there a way to to visualize like that at all? Do you see that as a likely feature. 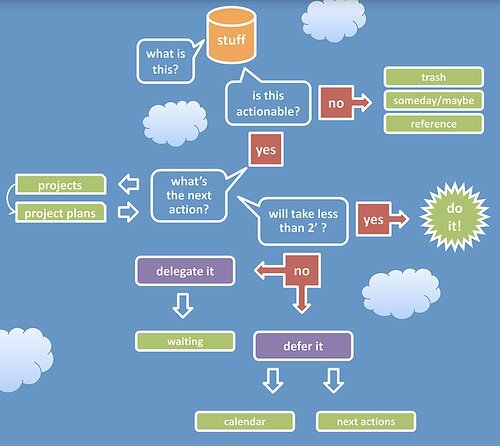 Regarding kanban, it’s something we might look at in the future but process visualization (workflow diagrams) is a definite plan. Right now, we have template overview: http://www.process.st/help/docs/template-overview/ — perhaps that’s helpful for seeing your processes at a glance? Very informative article Benjamin and indeed very resourceful links. The main thing is readability of the content beginners to advance level project managers or productivity specialists can easily understand this article. Next time you if you happen to write on task management or project management then please include our Task Management tool TaskQue link as well. It is super user-friendly and has many unique features such defined workloads, discussion option, dashboard summary of projects and task assignment to the whole team as one.